Negombo is a spectacular city of Sri Lanka that comprises an extended list of attractions to offer to its travelers. In addition to the attractions the place has a proximity to Bandaranaike International Airport making it perfect for tourists across the world. Further, this elegant beach town has some really decent hotels and relishing restaurants which are designed exclusively to meet the requirements of all. This city fits in the budget of every traveler. With such appeal Negombo affirms to be better-than-the rest in Sri Lanka. The vistas which one gets, including the locals of this place is spectacular. The sight of fishermen heading to the lagoon early in the morning having their oruvas and coming back to the home sweeping from the lagoon touches one’s soul. Negombo beach: It is one of the prime spots in Negombo that carries this elegant beach stretching from the north to an intriguing palm tree which endows a scenario as if guzzling the glowing sea into itself. The place is eminent for swimming and water sports and offers diverse adventures apart from the incredibly beautiful natural setting. 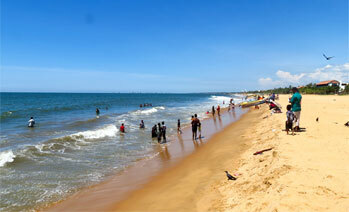 Besides the beach, there is Negombo beach park which offers a more vibrant and authentic picture of the place. There are eminent hotels lined up parallel to the coast which apart from bestowing an ecstatic holiday experience in Negombo offers a great view to behold. Dutch fort: Next to the Negombo beach, with close proximity to the lagoon rests the eminent ruins of the Old Dutch fort. The fort dates back to the 15th century and showcases a huge gateway that intricate inscriptions. The emerald Esplanade is another section where cricket matches are conducted. It is supposed to be a major attraction as the view looks perfectly stunning with an exciting match in front with the backdrop of a historical fort over which there is a glittering beach to mesmerize. 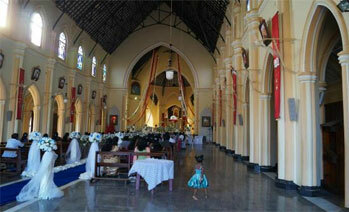 St Mary’s Church: Negombo is eminent for its graceful churches perfectly justifying the title of being ‘Little Rome’. Many of the locals are interested and had converted to Catholicism because of the strong religious instinct or influence. Standing in the town centre, St Mary’s Church affirms to be the prime attraction with having sweet pink chamber comprising most striking ceiling paintings covering the nave. Best time to visit Negombo: At initial months of the year like from January to April the city becomes quite dry and sunny. It’s better to avoid the place then. However, in July and August one might expect some showers. Therefore, the best time to visit the place would be during Christmas and Easter months as the place is primarily catholic and one can enjoy a lot of vibrant celebrations around this time of the year. How to reach Negombo: CTB private and intercity express buses run between frequent intervals making your travelling easy and accessible. Trains are also an option but not better than busses because trains are comparatively sluggish and infrequent. One can also opt for cab services.